It was the place that the late U.S. Vice President Richard M. Nixon fell for while on visit to Taiwan; he stayed in this old mansion instead of grand hotel suites for nights on end.It preserves its classical charms intact and rids art of redundant decoration, conveying to people the notion that art is an edifying source to modern life, which is as easy to approach as it is to absorb. It paints a brush of colorful glamour on Zhongshan North Road with its rich history; its historic architecture is a living testament to the century-old cultural and literary history of Zhongshan North Road. A century elapsed, and the original “Teshi Avenue” is reincarnated in the present “Zhongshan North Road.” It is now a grand boulevard lined with the most luxury hotels in Taiwan, and an important hub of local enterprises as well. An old mansion threatened with oblivion in time is now presented with a new epochal mission. In a metropolis like Taipei, due to the aggregation, diffusion, and interaction of passion of each and everyone involved, the Taipei Film House materializes an ideal and creates a space of infinite allure and fascination. At the defeat of the Ching court in the Anglo-French Allied Forces Invasion, the Treaty of Tianjin was signed in Xiangeng 8 (1858), and Taiwan was forced to open its ports for trade and commerce as a consequence. In 1859, American Envoy John E. Ward asked for Chaozhou and Taiwan to open their markets for trade. Through various complications, Tamsui was the first to institute the customs and levy taxes in Tongzhi 1 (1862); by January of Tongzhi 4 (1865), Keelung, Takau, and Anping were all open to commerce. Though the United States was the first to ask Taiwan to open its trade and commerce, the U.K. was the first to set up a consulate in Taiwan. Germany and the Netherlands came after, while most other countries entrusted their affairs to the British Consul in Taiwan. As for the United States, at first the counsel in Xiamen was also responsible for affairs in Taiwan. It was not until Tongzhi 13 (1874) that the United States stationed a resident Vice Consul in Cihou (present-day Kaohsiung), and assigned the post of American Vice Consul in Tamsui to the British Vice Consul in Tamsui. In the first years of Japanese rule, the United States first stationed in March of Meiji 30 (1879) a consular agent in Tamsui, in subordination to the Consul in Nagasaki. The first consular agent was James W. Davidson. In Meiji 31 (1898), the consulate was moved to the site of Smith Barer & Co. on Jianchang Rear Street in Dadaocheng. In September of Meiji 35 (1902), the then Consul Julian H. Arnold sent a letter of inquiry to the Civil Governor of the Office of the Taiwan Governor-General for a new site for the establishment of the consulate. 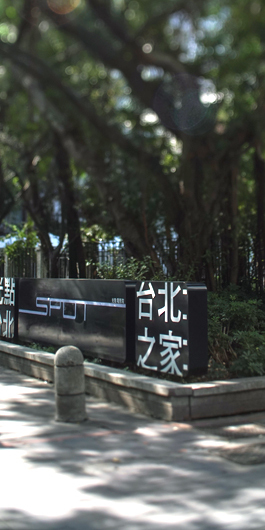 In May next year, the Civil Governor handpicked the site of the erstwhile fort behind Ximen Street in Taipei, which occupied an area of 872 pings. Unfortunately, unfavorable condition brought the plan to a halt. of Zhongshan North Road was the high street from downtown Taipei to the Yuanshan Shrine. In December of Showa 16 (1941), the Pacific War broke out, and the two nations proclaimed war, thus the consular services were ceased immediately. Overall, the American Consulate in Taiwan had been moved five times during the Japanese rule. After the end of World War II, the United States established its Consulate in Taipei in April of 1946, which was elevated to the status of Consulate General two years later. In February 1949, the R.O.C. government was relocated in Taiwan; on December 30th of the same year, the U. S. designated Robert Strong as the Consul General responsible for the Consulate in Taipei, which was replaced soon by the American Embassy. The initial site had been on 4, Sec. 2, Chungqing South Road, Taipei (the former residence of the late President Yan Jia-gan). The embassy was later moved to the official site of 116-118, Zhongzheng West Road, with the subordinate Navy Military Attache Office on 18, Sec 2, Zhongshan North Road. Karl L. Rankin (1953 – 1957) was appointed the temporary charge d’affaires and envoy for the American Embassy in R.O.C., who was later promoted to the rank of ambassador by President Eisenhower in 1953. It was Ambassador Rankin who chose this elegant and arboreous building as the ambassadorial residence. The five ensuing ambassadors, Everett F. Drumright (1958 – 1962), Ian G. Kirk ( 1962 –1963), Jerauld Wright (1963 - 1965), Walter P. McConaughy (1966 – 1974), and Leonard Unger (1974 – 1978), all made their residence in this building. The United States established diplomatic relations with mainland China in 1978. In January 1979, the R.O.C. government severed diplomatic relations with the United States, and the U.S. Embassy in Taipei was shut down on February 2nd. In 1979, the United States instituted Taiwan Relation Act; on April 16th of the same year, AIT/T commenced service. The unofficial yet substantial relationship between the two countries persists to this day. The signing of Sino-US Mutual Defense Treaty in 1954, the shooting of Liu Ziran by MAAG sergeant in 1957, President Eisenhower’s visit to Taian in 1960, the withdrawal of R.O.C. from the United Nations in 1971, and R.O.C.’s severance of diplomatic relations with the United States in 1979—all these events share a close connection with this building and the ambassadors residing therein. Every ambassador played a significant role in the development of art and culture in Taipei;distinguished guests to the Embassy included Huang Jun-Bi, Lan Yin-Ding, Yu Kuang-Chung, Chen Ruo-Xi, etc. Therefore this building is not only a testament to the Sino-US relations, but also a landmark in the cultural development of Taipei. Nevertheless, with diplomatic ties terminated in 1979, the consulate was shut down in February of the same year. the building was put out of use following the departure of the last ambassador Mr. Leonard Unger. The architecture itself is a two-story Western mansion with white exterior walls, in the style of colonial American south. The whole premises are slightly rectangular, with the hallway facing north. The jutting veranda on the east side offers perfect shade and shelter. The interior layout is designed around the central staircase; the simple and quaint colonnade is reminiscent of the Doric order. A quaint garden long deserted has been renovated with the goal of revitalizing the historic site and become the place where dreams come true. Taiwan Film & Culture Association defines the core value of the Taipei Film House as “a site combining the quaint charm of a historic site and cinematography and providing a locus for creative interactions” It is hoped that this place will serve as a watering hole for local creative artists, a place where creativity takes flight. Interdisciplinary ideas may be exchanged through diverse activities including film festivals, seminars, and workshops, in order to inspire more creative thinking. It is highly expected that a brand new look may emerge through the integration of the historic site and cinematography, fusing the historical significance therein with visual arts, and thus broaden our cultural field of view and cultivate a profound sense of culture.